...where students develop ideas and understanding, pursue passions and dreams, and hold themselves and their colleagues accountable for shared and individual work. Understanding the world around them, our students see what is and what should be and tap into innovative thinking to make change a reality. 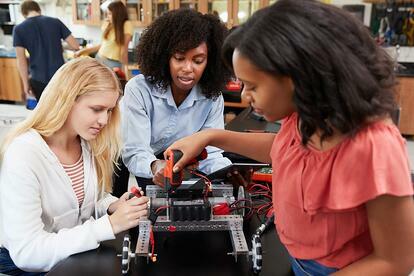 project-based learning (PBL) for all students. Whether in school or in life, we all must problem-solve by applying our knowledge of a wide variety of subjects and skills to any given issue or challenge. A project-based learning environment not only emphasizes subject-based skills, but also gives learners the opportunity to sharpen their problem-solving skills by applying cross-curricular lessons and authentically engaging as citizens of the world. A problem such as poverty, for example, may require a learner to understand the historical and sociological causes of poverty, as well as the mathematical and scientific knowledge to develop solutions. They may also need persuasive writing and oration skills to effectively convince others to help them address the problem. Perhaps a technological solution may require computer programming and product engineering knowledge. Studies show that the endless cross-curricular possibilities of high-quality project-based learning encourage higher engagement, achievement, and retention of knowledge in students. Bennett Day’s project-based learning is based on the Buck Institute for Education’s “High Quality PBL Framework.” The Buck Institute has been a leader in rigorous educational models for over 35 years. You can read all about the framework on their site, which is located here. The Bennett Day School year contains three trimesters of approximately twelve weeks each. During those trimesters, students typically participate in a long-term cross curricular project, at least one seminar (including laboratory seminars) and online course, and an internship/apprenticeship. How does PBL fit into the Upper School schedule? Learn more about what a student's full day might look like here.